This year, my daughter’s last day of school took me somewhat by surprise. She’s been finished with all work and even finals for a while now. On days of exams from which she was exempt, she didn’t need to show up on school grounds. Or did she? Would her absence be excused? Did I need to call the school or send a note, and what should I say? Would she be penalized if I told the truth? Would that even matter? We’ve debated these questions for four years, and the answers remain up in the air. My daughter has grown from young teen to young adult in this span, but some things we never managed to learn. Only this much was certain: if she showed up to class, there would be no assignments to complete. She had finished them all, and successfully, more than satisfactorily. But there would be parties and goodbye opportunities not to be missed. Tradition is important to my daughter. 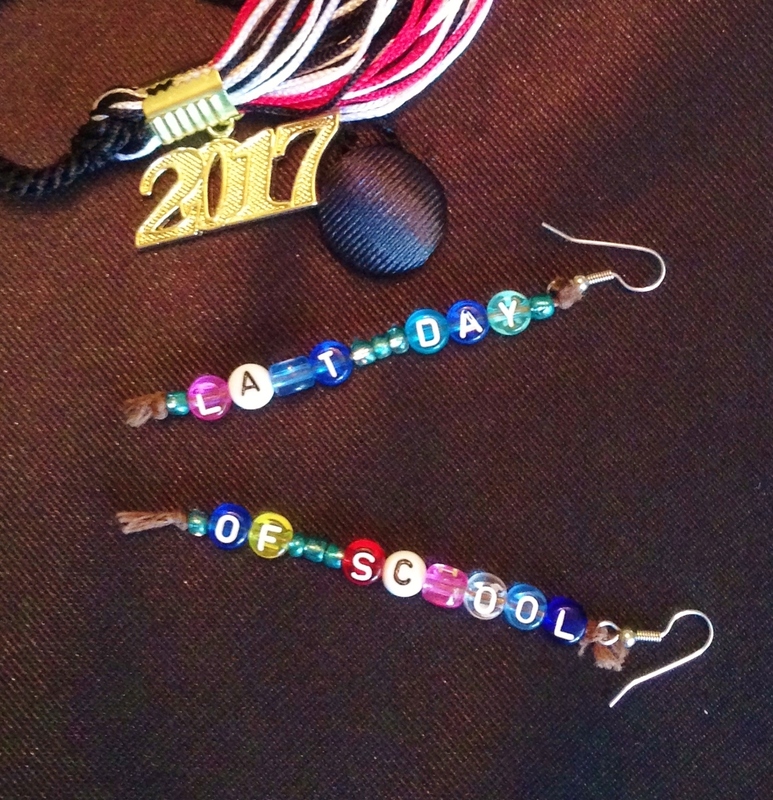 On Monday she wore her “Lazt Day of School” earrings. She made these in sixth grade, and she has worn them every last day since. She used the alphabet beads she got for Christmas when she was three. No more s’s remained in the set; hence the z in “last.” Monday was apparently the official last day of classes for seniors. But many special activities continued this week: Convocation, Senior Picnic, Senior Breakfast, graduation rehearsal, the Senior trip to Kings’ Dominion. Today there is yet another graduation rehearsal. The actual graduation ceremony is tomorrow. In the wake of so many to-dos surrounding the close of senior year, the reality of my daughter’s graduation has escaped me. I started to write “endless to-dos” above. But they’re not endless. In fact, they are ending. Really and truly. They end today. The thought lands with a thud. I haven’t had a chance to consider the true finality of it all. The finality that this “commencement” entails. I’ve been a bit cavalier about these end times. Our daughter is rarely at home; she merely stops by briefly. 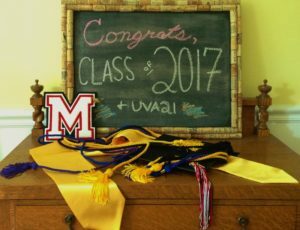 When she leaves for college, it won’t be that different, will it? For now, I’m going to keep telling myself that’s the case. I have the summer to come to terms with her departure. To face the new beginning that follows this ending.